손잡이 재질이 위에서부터 올리브나무, 코코볼로우드, 황소뿔, 지르코트우드 입니다. 여기선 코코볼로우드와 황소의 뿔 제품만 판매 중입니다. 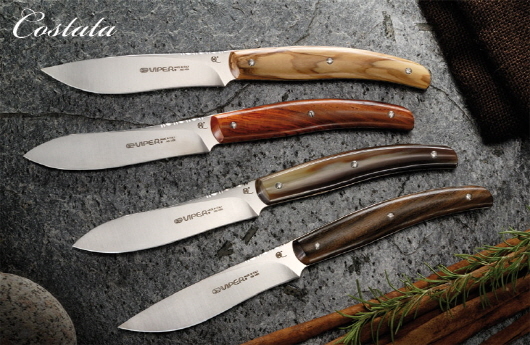 Our table knife is a fixed blade that draws on the Britola design. The stainless AISI 440 steel blades are real sharp and can have a drop or clip point tip. The spine is refined with a filework pattern that gives a great support to the index finger. The Costata is sold in smart hard 2 or 4 piece sets. You can choose between different cocobolo, zircote and olive wood shades or succumb to the ox horn charm. Blade Material : Full tang steak knife, drop point AISI 440 stainless steel blade, HRC 55-57. Handles: made of genuine horn with stainless steel screws. Package: 2 pcs. gift set.